let's detour into visual design - did you notice this on the previous update? block diagram of Megapixy brightness control (first try). a capacitor at the input of the microcontroller's ADC. and to explain that, i'll have to talk about PWM. pulse-width modulation (PWM) means controlling something with a series of on/off pulses. the perceived 'on-ness' (e.g. backlight brightness) is based on the fraction of time when the device is 'on'. this fraction is called the duty cycle. the on/off pattern repeats with a fixed frequency. the backlight driver's on/off pulses were a PWM running at 500Hz. i was powering the Megapixy with a cheap 5V power supply, which was now having to supply more & less power on a 500Hz cycle. this caused my power supply to buzz audibly at 500Hz - the so-called 'coil noise'. how could i fix this? a 20% duty cycle at 500Hz requires 0.4ms 'on' pulses. a 20% duty cycle at 20kHz requires 0.01ms 'on' pulses. during each 'on' pulse, the backlight driver has to turn on and pump up the backlight voltage. this process takes about 0.01ms. if the backlight driver doesn't have enough time to turn on, it shuts down completely until the circuit is reset. with a 20kHz PWM, this places a 20% minimum duty cycle on my backlight brightness control. a 20% to 100% brightness adjustment isn't good enough. so what can i do? in PFM, the duration of each 'on' pulse is always the same. to reduce the duty cycle, you can increase the time between 'on' pulses. at very low duty cycles, you will have large gaps between each 'on' pulse, which means a lower (and perhaps audible) frequency. but PFM is still worthwhile because you can reach a lower duty cycle (brightness) without shortening the 'on' pulse. this gives the backlight enough time to turn on, even at very low brightness settings. partitioning of brightness control into smoothly-transitioned PWM & PFM. featuring a random notebook from a random hotel. cartoon of hybrid PWM/PFM brightness control. that's enough about brightness control! with the Megapixy. why? let me count the ways. the 'comma' board looks stupid and wastes space. it's a sure sign that i haven't constrained it enough. the Displayport cable sticks out at a stupid angle, like an awkward elbow. it should attach neatly, next to the screw mount. let's address 1. why does the 'comma' board waste space? it stretches left to reach the LCD cable, as the cable comes straight up from the panel. it stretches right to reach (and house) the on/off switch & brightness dial. it requires too much z-height, because the tallest components (backlight capacitor & inductor) must fit under the screen. to fix 2, i want to reposition the Displayport video connector, so i definitely have to move the LCD cable connector. i might as well move it closer to the controls, to reduce board size. how can i make the cable reach its connector's new position? i can bend it. duh. i can also move the tallest components out from under the screen. it saves a precious millimeter. this was around the time that H.R. Giger died, which made me sad. 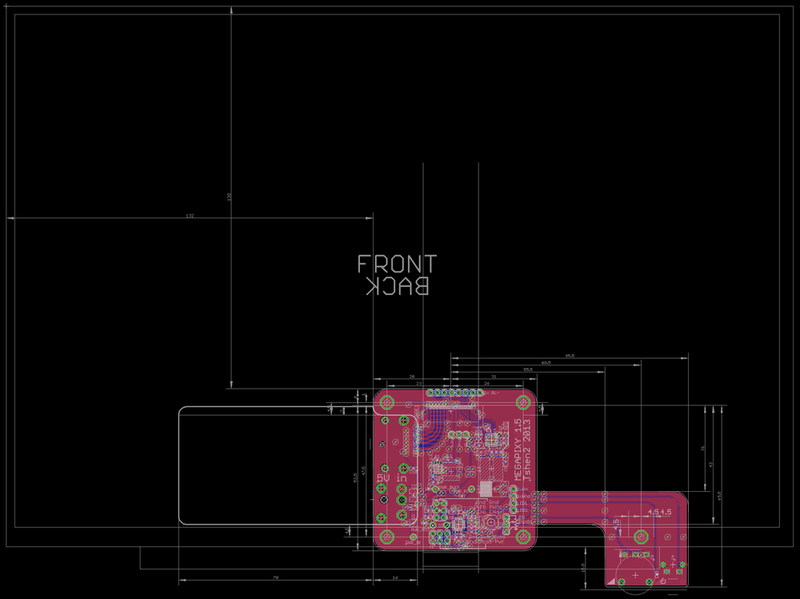 being in a Giger-ish state of mind, i ended up making a PCB which looks.. strangely organic. i call it the Giger board. assembled Giger board in chassis (TBA). LCD cable, bent to reach new connector position. backlight capacitor & inductor, no longer under the screen. the on/off switch cover has a living hinge. the result is a smaller, denser, more beautiful board which scratches my artistic itch. but there's still two problems to solve! and that's what we'll talk about next time. next update: fancy chassis design, lasers, lasers, lasers. why is the bottom-right footprint not like the others? but that screen! it's glorious. 2560x1700 pixels, 13 inches across. that's 4.3 million pixels at 239 pixels per inch. 3:2 aspect ratio. massive contrast, huge viewing angles, colors out to infinity. it's IPS at its best. apparently it's got some whacko connector on there - an IPEX 20474-040E-12. how do you connect to that? i'm guessing that this is where most hackers get stuck. but i really, really like screens, so i keep going. so i randomly ping LCD cable manufacturers on Alibaba. they're all in China. so obviously the Chromebook Pixel LCD panel is the way to go. and it's big enough that people might actually use it at a desk. so let's jettison all the internal-battery stuff, and focus on making a really solid wall-powered screen. i'd like to point out: at this point in my career, i had no idea what i was doing. i am drawing things! with computers! i'll ask a friend to lasercut the frame, because idk lasers. and idk mechanical design either. so instead of an enclosed frame, let's make a crappy rollcage with a front bezel and a back panel. but how to hold the panel in place? i call it the 'L' board. it's obvious, even in the dark. a dial is ideal for adjusting brightness, and doesn't feel like a button at all. why is this happening? because the 'L' board is a crude extension of my test board. 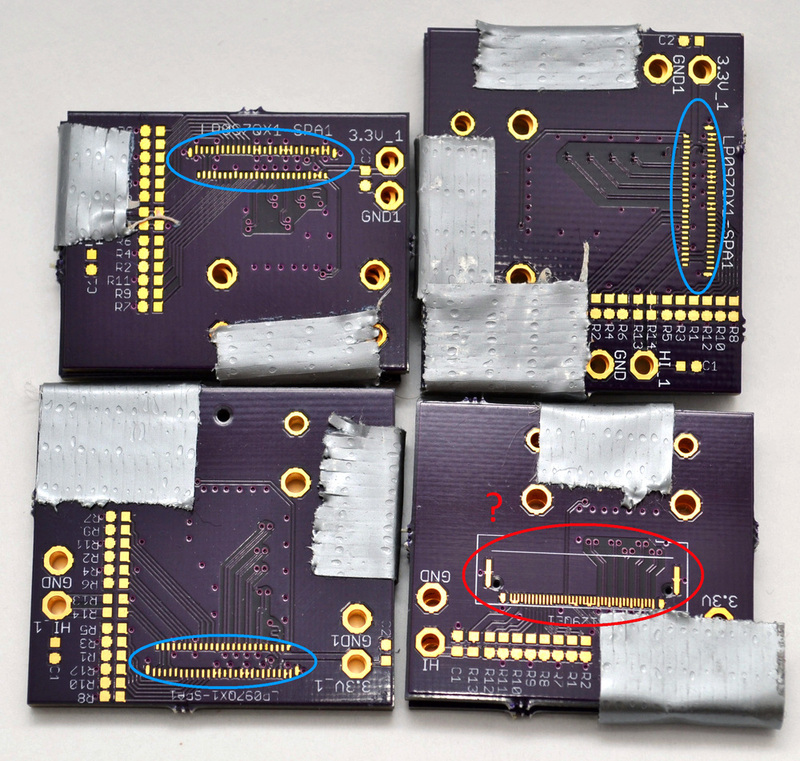 i tried to keep my high-speed traces as short as possible on the test board, which created that awkward cable collision. the lowest board worked the best. now there's a 90-degree bend between connectors to prevent cable collisions! and with this, i built the 'comma' board. this lets you build a mega-screen with multiple LCD panels and control boards. you only need controls on one board, which communicates with the rest. i also began doing basic mechanical drawings in Eagle. and now, with lasercut chassis. it's alright. lasercut chassis with 'comma' board, back view. note the 1/4-20 tripod screw mount. as compared to my first disaster, it's much lighter, with a more even weight distribution. this means i can mount it on a flexible boom arm instead of a heavy tripod. boom arm with 1/4-20 screw mount, constructed from this and this. chassis mounted on boom arm. i guess it's.. basically functional? but i'm not satisfied. the LCD panel is held in place by a 'lip' mount below the bezel. this puts uneven stresses on the panel, causing backlight bleed. next time: Megapixy logo, Giger board, the beginnings of beauty.